When looking at the options for redesigning this ensuite, we wanted to make full use of the space. We opted for a compact but spacious shower unit, allowing for plenty of space and freedom in the bathroom. It also allows the owners to maximise the available space for other use. 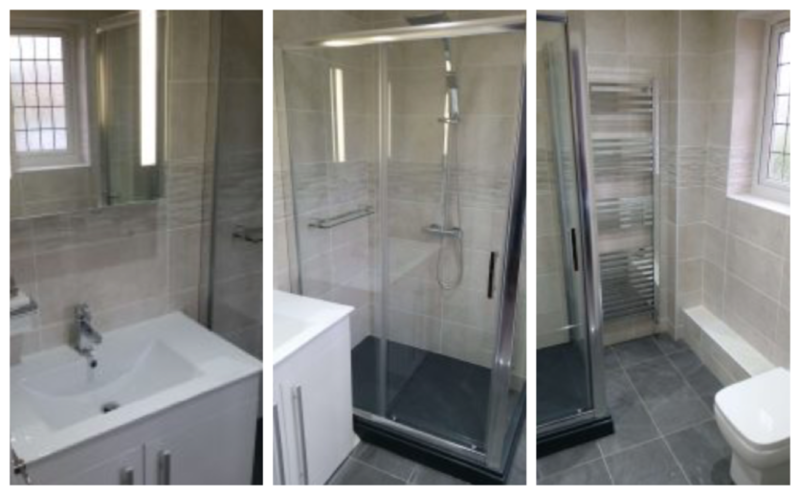 We removed the old shower cubicle, basin, toilet and tiles to replace them with more contemporary, high-quality furnishings and units. We replaced the old shower with a walk-in shower with a dual shower mixer. It also includes a 1400×800 shower tray and sliding door system with glass end panel. 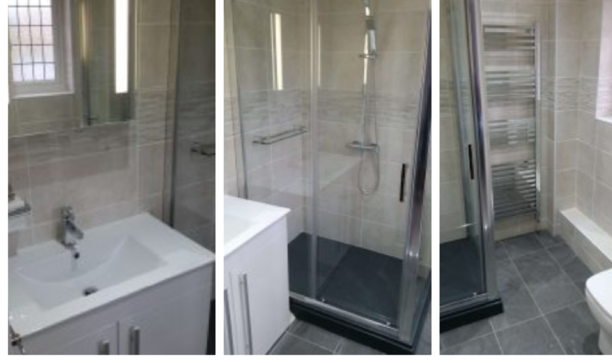 These types of shower panels exceed any other type in terms of a more straight forward cleaning experience, as shower panels requiring wheels or joints, usually get affected by limescale. We installed a modern, square shaped basin with spacious cabinet, providing extra storage for toiletries. We also fitted a stylish, tall towel radiator which gives the user plenty of room to warm and dry their towels. We replaced the walls and floor with porcelain tiles. On the wall, the porcelain tiles are split up with a border tile. This style of tile give this en-suite bathroom a superb modern styled appearance. Finally, we installed some extravagant white LED lighting in the fitted mirror and ceiling. Did you like this project? Need some more inspiration for your new makeover? Fill out our contact form or call us on: 01234 743642.